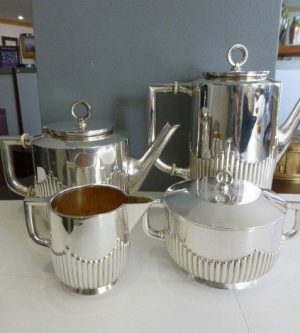 Art Deco Style Sterling Silver Cream and Sugar Bowl. C. 1920. Some Cosmetic damage, can be polished to get rid of most. Both pieces have have minor dents on bottom. Sugar bowl weighs 8 ounces and the Creamer bowl weighs 6.2 ounces.